I haven’t actually bought that much EDC kit recently…which is unlike me! 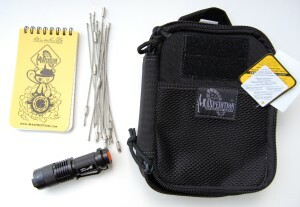 The Maxpedition Fatty EDC Pouch is excellent! Build quality is the usual maxpedition high standard and I have now got my main kit together so I can now easily drop this pouch into any bag I’m taking away. The Cree Q5 flashlight is a great bit of kit for under £2! I showed this to a friend of mine (who didn’t believe it would be any good!) and he has now ordered a couple of them…and another couple for me as well! The Stainless Steel Loop keyrings are good value for under £2 for 20! There are no sharp pointy bits and they screw together easily. The only downside was that two of them didn’t have the screw ends so couldn’t be used. They also came from china so took a few weeks to get here. Haven’t used the Rite-in-Rain notebook yet but have it in the Fatty pouch as a spare.